Looking for a strip project? This jelly roll friendly quilt is beautiful! Val Horner will guide you through this colorful adventure. 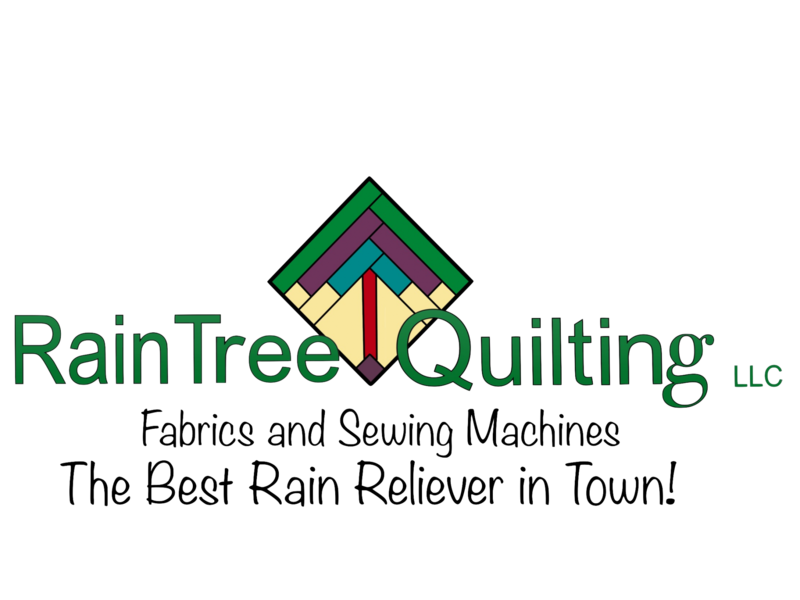 This class is open to all individuals who purchased their BERNINA at RainTree. It is especially geared towards new owners. We will be teaching on current models. Stop in and register. Be sure to tell the clerk which machine you will be bringing. 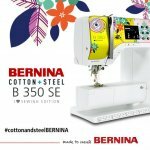 Also, locate the BERNINA tab on this website. You will find the appropriate class workbook for your machine there. Please download and print it. B215, B1008, B330 and B350 owners will need to attend on the Monday and Tuesday only. 5 Series, 7 Series and 8 series owners will need all three evenings. You must register to reserve a space. Thanks! Learn how to machine quilt with your walking foot. And, yes, get out of the ditch! Why limit yourself to "stitching in the ditch" when there are so many other possibilities? Time will be spent discussing needles and threads as well as examining the walking foot itself and how it works. Bonnie will demonstrate and lead students through a variety of techniques, including: match stick quilting, cross hatching, radiating lines, curves and spirals. The goal is to help students become more familiar with and comfortable using a walking foot - to get out of that ditch and create unique quilting designs. Join Dawn Collinsworth and make a set of Scalloped placemats! Join Bonnie for this mystery and noon on Sunday. Stay an extra 2 hours for open sew! Bonnie loves making bags!!! This particular bag is her favorite not only because it is a great size, but also because it can be customized to individual needs: type of fabric used, number of pockets, size of pockets... The supply list will help you make decisions as you customize your bag. The bag itself makes a great gift; Bonnie gave each of her sisters one for Christmas and they loved them! This project will help hone seam allowance, edge stitching, pressing and measurement accuracy skills. Come join Bonnie and get hooked on making this great bag! Come join us to make this sweet sweater. Confident beginner. The a-la-carte option is for participants that cannot commit to the year long program. It is necessary to register early enough so supplies are ready for participants. This spacious bag features a unique top zipped opening and exterior pockets. It's perfect for travelling afar or close, to the gym! The Travel Handmade classes occur on the Wednesday following the 2nd Tuesday of each month. Travel Handmade customers are urged to register each month for these technique rich classes. We are using ByAnnie's patterns to create a different travel related project each month. Join RTQ staff this year OESD's embroidery club. RainTree is using OESD curriculum, offering you hands-on learning opportunities. The club focuses on a wide variety of specific techniques, techniques that become necessary tools in your embroidery experience. Each club meeting offers participants the opportunity to create a project. The purchase price includes embroidery designs for the year. This great-for-family travel organizer is sure to please. Strap it onto the seat of a car, back of a stroller, or.... design it to hang on the wall as an organizer. The Travel Handmade classes occur on the Wednesday following the 2nd Tuesday of each month. Travel Handmade customers are urged to register each month for these technique rich classes. We are using ByAnnie's patterns to create a different travel related project each month. This mini backpack works as a small purse or child's backpack. The Travel Handmade classes occur on the Wednesday following the 2nd Tuesday of each month. Travel Handmade customers are urged to register each month for these technique rich classes. We are using ByAnnie's patterns to create a different travel related project each month. Join us for a year of AccuQuilt mastery! This club will meet on the third Sunday afternoon of each month in the BERNINA classroom from 1 - 5pm. Participants will need their cutters and dies for the selected project. Club members will receive a 20% discount on required dies and or cubes. (Club membership is separate.) See sample in store. This cosmetic organizer project also includes a pattern for a flat iron sleeve! The Travel Handmade classes occur on the Wednesday following the 2nd Tuesday of each month. Travel Handmade customers are urged to register each month for these technique rich classes. We are using ByAnnie's patterns to create a different travel related project each month. Travel Handmade: Zip It Up! Choose the size and make at least one streamlined organizer. You will definitely want to make more! The Travel Handmade classes occur on the Wednesday following the 2nd Tuesday of each month. Travel Handmade customers are urged to register each month for these technique rich classes. We are using ByAnnie's patterns to create a different travel related project each month. This duffle features pockets inside and out! The Travel Handmade classes occur on the Wednesday following the 2nd Tuesday of each month. Travel Handmade customers are urged to register each month for these technique rich classes. We are using ByAnnie's patterns to create a different travel related project each month. Travel Handmade: Pack It In! You choose from 3 sizes! These cases are designed to organize your belongings as you travel. The Travel Handmade classes occur on the Wednesday following the 2nd Tuesday of each month. Travel Handmade customers are urged to register each month for these technique rich classes. We are using ByAnnie's patterns to create a different travel related project each month. Feeling challenged with software? Regular participation in this program will equip you with the ongoing training needed to successfully grow in your software knowledge. Each session will include video guided hands on instruction. You will meet on the third Tuesday of 8 months plus receive bonus materials throughout the year. Meetings will occur in February, March, April, May, July, August, September, and November. Please bring your software loaded laptop and a USB stick. You will be given a copy of the video and all related materials for each session for further review. Garment bags are great for packing those garments for special trips. This project features lot of pockets too! The Travel Handmade classes occur on the Wednesday following the 2nd Tuesday of each month. Travel Handmade customers are urged to register each month for these technique rich classes. We are using ByAnnie's patterns to create a different travel related project each month. The travel bag features a strap so you can attach it to your rolling luggage. It is carry-on compliant. The Travel Handmade classes occur on the Wednesday following the 2nd Tuesday of each month. Travel Handmade customers are urged to register each month for these technique rich classes. We are using ByAnnie's patterns to create a different travel related project each month.